The final installment of the Trail of the Apprentice-series clocks in at 62 pages, 1 page front cover, 1 page inside of front cover, 1 page editorial, 1 page SRD, 1 page ToC, 1 page inside of back cover, 1 page back cover, leaving us with 55 pages of content. To this, we can add a nice 12-page (already minus front cover/editorial) art-and-map-folio, which contains GM and player maps as well as a version sans grid and the original pieces of art for hand-out purposes. Neato! As always, Trail of the Apprentice is made for family game night and with the express purpose of teaching new groups of players and GMs how to play the game. Kids ages 8+ should be good with this series, unless they are extraordinarily sensitive. Younger kids, depending on temperament, may enjoy this as well. As always, I strongly suggest rewarding kid-groups in particular for nonviolent and nonlethal conflict-resolution, something the whole series, alas, does not account for. All right, still around? Only GMs here? All right, so last time we saw the heroes, they had slogged through the oracle’s test and were rewarded with knowledge of Belazeel’s plan with the stolen serpent statues: Seems like the wizard is trying to use them as keys to open the so-called Basilisk’s Shroud and unleash a dread entity known only as the “Sorceress”, hoping to learn her arcane secrets. The PCs, in the aftermath of the last modules, may have additional information that will prove helpful as the PCs embark upon their journey into the shadescar rift, where an access to the underworld of Terrallien awaits – a place where mysterious things lurk and the planar boundaries have grown thin. Somewhere down there awaits the thieving wizard Belazeel and it’s up to the PCs to stop him. Thus, the PCs venture forth into the time-tested environment that has ignited countless imaginations, the underworld: Nice on this account, as the PCs begin exploring the respective environments: Terrallien’s emphasis on planar overlaps allow for a very diverse array of micro-biomes; it’s providing a logical rationale for strange compositions of cavern-features and foreshadows an integral component of the final dungeon. Also nice: The PCs will, pretty much in the beginning, already find earth elementals and may actually employ Diplomacy to avoid trading blows…but the elementals speak of bitter earth…and indeed, as the PCs progress, they will stumble into a rather major altercation, wherein savage troglodytes assault svirfnbelin. Helping the deep gnomes (hopefully, considering the information supplied by the oracle in #4…) is a relatively easy task…at least in the beginning. They have been cut off from their people and can guide the PCs to the Heart of the Stone, the final dungeon and Belazeel’s destination…but in order to do so, the PCs will have to deal with the new “god” of the troglodytes – a nasty, vile-tempered black dragon named Kezzerex. Now, this arguably hits a pet-peeve of mine. I consider using dragons in early game a waste of the oomph and gravitas that should accompany these apex-predators. It waters down the experience and awe that should accompany finally dealing with such an engine of destruction. That being said, this is a personal issue and will not influence the final verdict. The pdf does use a tried and true means of driving home the power of dragon, though: Basically, the monster is CR 8 and as such POWERFUL to the point where the PCs better heed the suggestions of the oracle and the svirfneblin and deal with a mimic, gather magic weapons, etc. – the dragon is rendered beatable due to several custom-made anti-dragon magic items strewn through the section: From an acid-absorbing shield to a dragon-killing sword. These tools provide the mathematic edge to triumph versus the dragon. This gambit is not new, but in play, the experience worked well this time around: Thanks to hazards/terrain and the limitations of the dragon’s maneuverability, the PCs have a reasonable chance to succeed without making the combat feel too easy. There are 2 things that really irked me, though: One, the dragon is not the BBEG and being reduced to basically the half-way-boss is not too impressive…and it sets high expectations for the final boss. Secondly, and more importantly, there is pretty much no option to use guile or Stealth to bypass the dragon. If the players refuse to deal with the svirfneblin and instead try to somehow get past the dragon…the module does not really cover that. Transition from these caverns to the final dungeon is a story-device alone – the PCs can’t track Belazeel, can’t sneak past the dragon…and the lack of such options takes away from player-agenda. And yes, this happened in my game. Now, once the draconic menace has been dealt with, it is time for the PCs to tackle the eponymous wizard’s dungeon, the heart of stone. Nice, btw. 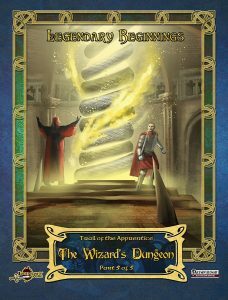 : A fully credited new creature with a nice Achilles heel sets the tone from the get-go: You see, the dungeon is basically the pdf introducing the concept of planes-lite to the players. Each of the rooms of the dungeon has a required activation, which rewards problem-solving skills and does not boil down to just roll-playing; the rooms, upon activation, take on planar traits, which smart PCs can use to their advantage as they make their way through the dungeon. Speaking of the dungeon: It is really nice to see its Sephirot-shape (not, not the FF VII character, but the 16th century-version of the Kabbalah’s concept!) – and indeed, upon the final activation of the respective room, the path to Da’at is free – to knowledge. It is here I’d like to truly commend the author – aligning e.g. the room corresponding to Keter with positive energy, for example, bespeaks a careful thought-process and deliberate decision to structure the dungeon this way. Kids probably won’t notice, but adults interested in occultism will most certainly appreciate this added level of care. Kudos! Within the central chamber corresponding to Da’at, the PCs will see the scene depicted on the cover: The two serpent statues have grown to an entwined, massive size, with glowing power emanating from it. Here, Belazeel, his bodyguard Jubal, his familiar and a fiendish giant spider ask for the final dance with the PCs, but after handling the adventuring group in #4, that should not be an issue. And it shouldn’t be. See, the PCs better hurry, for the Basilisk Shroud is torn, and sooner or later, the legendary Sorceress will emerge from the shroud. Turns out that the magical mirror the PCs found earlier may provide them just the angle to win here…considering that the dread entity is weakened: Her arcane power amounts to making force weapons and force bolts. No spells, no other unique tricks…which is rationalized with the prolonged imprisonment, sure. Yes, she is deadly. But the PCs have killed a dragon in this very adventure…which renders the final encounter sslightly anticlimactic. It’s a good two-phase boss battle, but in context, it does lose a bit of its impact due to what has gone before. A missed chance: Her HD do not represent her power and if the PCs think about sending her back (after all this build-up, they may well believe her to be far beyond their means to defeat!) into the shroud, the module does not account for such a smart decision. Which brings me to my main gripe here: It boils down to kill this legendary entity. The PCs can’t really stack the deck in their favor before this encounter, which means that it’s quite likely that they’ll fight her on relatively fair terms (fairer terms than the dragon-encounter) and in the end, comment about how she was not all that powerful. If I may: A significantly more rewarding way of depicting her would be for the GM to allow the PCs access to the whole dungeon. They have explored and “learned” all those planar traits, so using them against the sorceress, going through the dungeon in reverse with snatched serpent statues to reseal her as she gives chase and promises power unimaginable, can make for a significantly more memorable scenario. Just give her a 3-round cool-down instead of bringing her out directly and let the statues revert. Sow hints for the like before and you’ll have taught the PCs not only that rollplaying does not always triumph, but you will have also engaged their faculties, rewarded their observation and diligence. And the reward will be an out-of-breath “We did it!” instead of a “And she was supposed to be that strong? ?” – the players in such a scenario will feel like they have played in the big league without diminishing the achievement of defeating the legendary BBEG. So yeah, the finale is solid, but it could have been easily a legendary one, considering the structure of the dungeon. Editing and formatting are good, I noticed no grievous glitches. Layout adheres to Legendary Games’ two-column full-color standard and the pdf sports nice full-color artwork and cartography. The pdf comes fully bookmarked for your convenience. Paris Crenshaw’s finale of Trail of the Apprentice is very much a two-part affair: The first part in the underworld is solid, if not the most amazing excursion into the wondrous realms below. The planar overlaps steal a bit of the show that would usually be reserved to the unique environment. The section does not make much use of verticality, the presence of ceiling, etc. – it’s not bad, but it did not blow me away. The eponymous wizard’s dungeon, part II of the module, on the other hand, is pretty much one of the two most brilliant highlights in the whole series: The structure and themes of the dungeon are strong, the challenges diverse and the only other section that could stand up to it in the series would be #3’s excellent dungeon. The final boss fight is similarly a mostly rewarding experience, though one that, considering the amazing dungeon, feels a bit tacked on. Particularly experienced GMs may want to consider my suggestions above to add some oomph and gravitas to the proceedings. Heck, even new GMs may want to consider that – after all, modifying modules are a crucial GM-skill and if you’ve managed to get through #4, you’ll have at least a bit experience in that part. From a structural point of view, the linear progression from Part I to Part II represent one weak point of the module…and as far as I’m concerned, I would have loved the evocative dungeon to get a bit more space (and less underworld-stuff), since it actually is really, really cool and since the underworld acts mostly as an XP and treasure-source. That being said, this represents a worthy conclusion for the series. It does not reach the level of amazingness it could have easily reached, but as a whole represents a fun, if not perfect end for the series. My final verdict will hence clock in at 4 stars. While my review is based on the PFRPG-version, there is also a 5e-version that can be found here! Want the whole series? You can find it for PFRPG here! The whole saga for 5e can be found here!